Two Years Later, Will Ireland Light the Way Again? 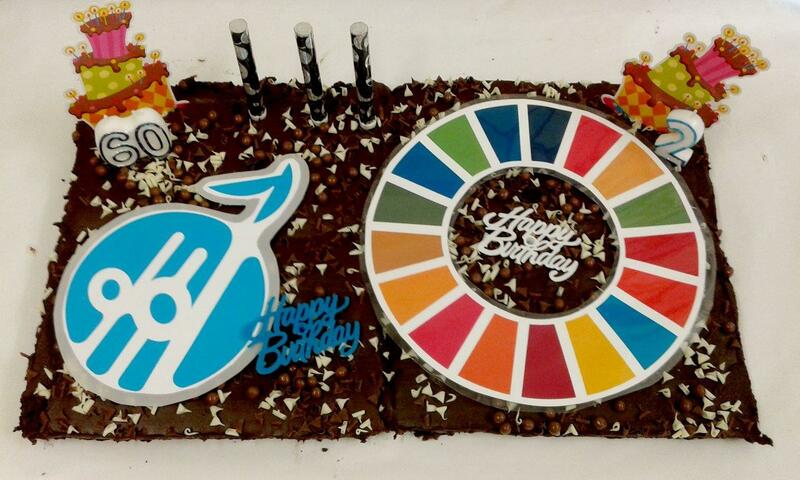 On 25th September 2015, world leaders agreed to a definitive plan for the planet and the people on it: 17 Sustainable Development Goals have been adopted. 193 governments signed up and if they stick to the plan the results will be extraordinary. End poverty. Fight inequalities. Tackle climate change. And leave no one behind. It has already been two years. Is Ireland on track? Is Leo Varadkar and other world leaders sticking to the pledge? For the goals to be reached for everyone, everyone needs to do their part: governments, the private sector, civil society and people like you and us. Early in September 2017, ATD with all members of the Irish Coalition 2030 wrote to Taoiseach Leo Varadkar a pledge to make the Budget 2018 a 2030 Agenda Budget (see letter here). On the 2nd anniversary of the SDGs, ATD called on its friends and volunteers to to join the Coalition 2030 and many other organisations worldwide in the “Global Day of Action”. On the 24th September, ATD organised “Stronger Together”, a community event to celebrate the 60 years of ATD International and to mark the 2nd Anniversary of the Global Goals! 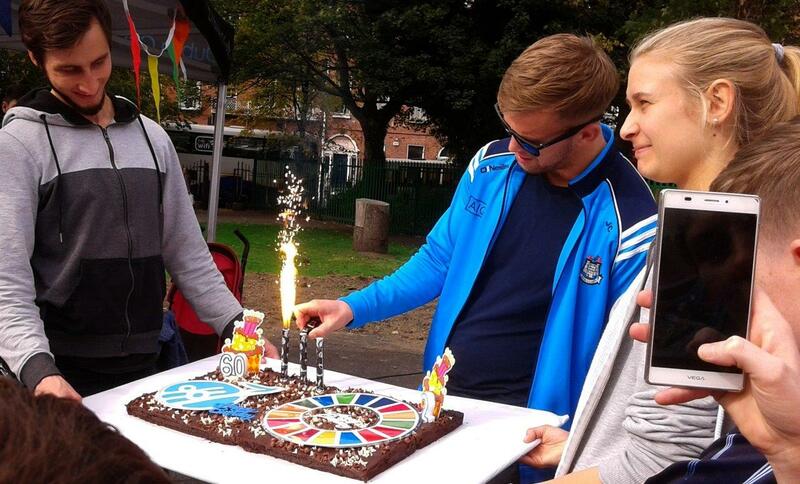 GAA Football Dublin star Jonny Cooper joined us for the event! More pictures of the day here! 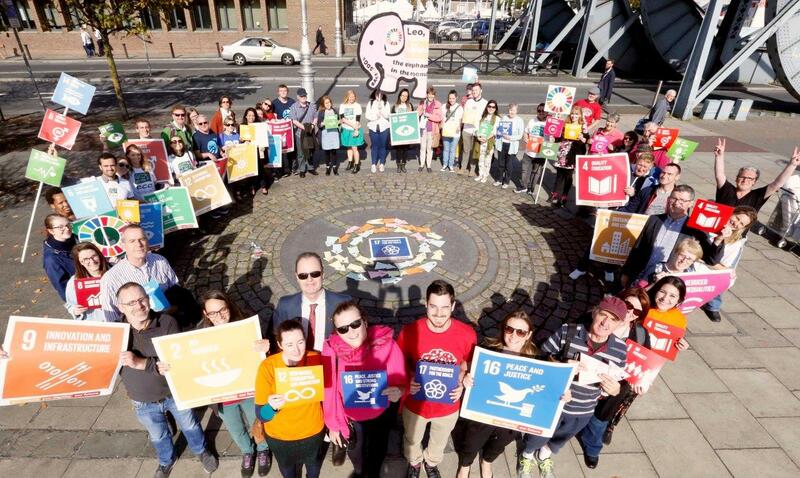 On Monday 25th September, day of the 2nd anniversary, at lunch break the Coalition 2030 invited its members to join us from 1pm to 2pm in a symbolic Act 4 SDGs March from the Rosie Hackett Bridge to the Famine Statues and the Human Rights and Poverty Stone. The March was organised by the Irish Environmental Network, World Vision Ireland and ATD Ireland. 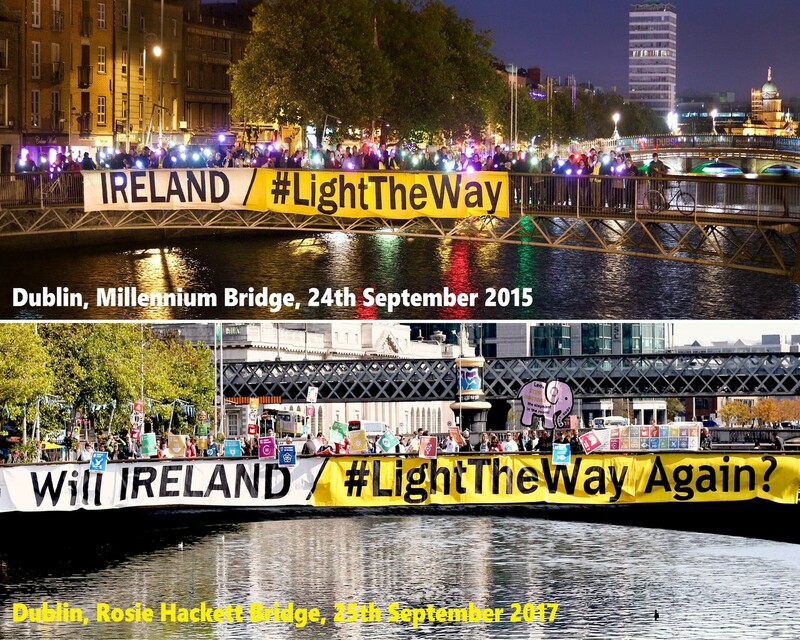 The 25th September 2015 banner “Ireland, Light the Way!” has been modified for the event with an addition of 2 words: “WILL Ireland Light the Way AGAIN?”. The banner was displayed on the Rosie Hackett Bridge. of the world leaders of his generation? We believe you own the SDGs. Your actions both big and small can help. Together we will be turning the plan into action, promises into reality and make sure that no one is left behind. Join a global movement. Make every voice count! ATD Ireland will be at the Irish Aid Volunteering Fair 2017! Come and discuss ways to volunteer long-term in one of the 100 projects run by ATD local communities across 40 countries around the world! Join our Local Volunteers Network: help us in many ways from the running of our projects: fundraising, translating English<>French to maintenance in the office, special events, administration, family support and a whole lot more. Whether you like to work alone or in a group, in an office or outdoors, on the front line or in a support role, we can always use the help and we are flexible according to your available time and skills. Currently we are inviting volunteers to support 3 specific projects. Read more about them here! Join a 3 months internship to start the discovery of the ATD’s Overseas International Volunteer Corps: ATD International Full-time Volunteer Corps members make a long-term commitment to working alongside families living in extreme poverty and are involved in activities and projects in Ireland and overseas. They agree to live on same basic stipends and make themselves available to go where their expertise and skills are most needed. Families, couples and individuals of all ages, from a variety of backgrounds and with an assortment of practical skills and qualifications, make up this diverse group of dedicated, full-time workers. There are a number of steps and ways to joining the Volunteer Corps, the first being involvement in ATD activities and projects here in Ireland. Read more on ATD Full Time Volunteers! Visit the ATD International website! Follow updates about the event here! Every year ATD Ireland supports the “4 tests” call on the Government by the Community Platform. 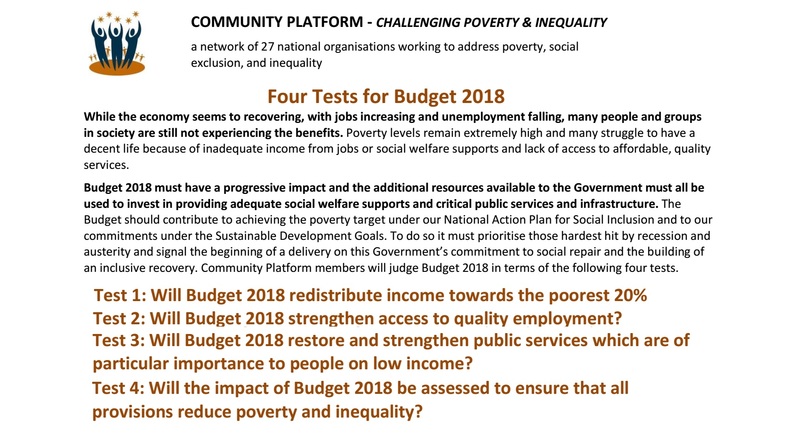 As ATD we want to underline one request of the “4th test”expecting from the Budget 2018 to “Set aside funding for pilot projects with the aim of developing long-term participatory processes in which people with experience of poverty and their organisations could contribute to the assessment and monitoring of policy”. Stronger together! Community and Human Rights values for a better future! To mark the 2nd Anniversary of the adoption of the 2030 Agenda for Sustainable Development (25 September 2015 – see here), and to celebrate the 60 years of the first community initiative in 1957 that was the starting point of the development of the International ATD Fourth World Movement. 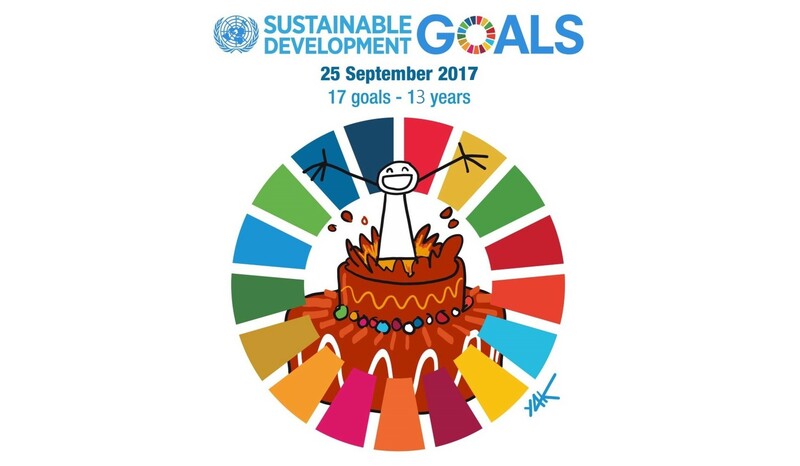 ATD Ireland invites you to a fun and sport outdoor event in Mountjoy Square Park (Dublin 1) on Sunday 24th September 2017 (from 1pm to 5pm).It will be a day to celebrate community and human rights values which are at the origin of the 17 Universal Global Goals. You will be able to discover the NGOs and groups working on and around Mountjoy Square! The Magnificent 17 will strike back in town for this special occasion! The event, taking place 3 weeks before the UN #EndPoverty Day (www.17october.ie), will also be an opportunity to promote the spirit of the UN Day and present its history! Updates will be also available via Facebook! Join Now The “End Poverty Day” Volunteer Team! ATD Ireland and the Irish 17 October Committee are creating a new volunteer team to support the preparation and organisation of the events which will take place in Ireland and especially in Dublin on the 16th and 17th October to mark the 30th anniversary of the UN End Poverty day and the finale of the 2017 #StopPoverty Campaign (see www.poverty-stop.org). A first team meeting will be organised on 12 September 2017 – More here!